Gearbox wants Borderlands 2 to be the best game regardless of platform. Sometime over the last ten years, the design of cutting-edge shooters moved to be native on consoles instead of the PC that gave birth to the genre. Whether hearing that makes you cringe like you just heard Gwenyth Paltrow sing while scratching her fingernails down a blackboard, it will only add insult to admit that the PC port of such shooters is often an afterthought. With all the development problems the first Borderlands had, it is not surprising that little thought was given to the UI of the PC version. Thankfully, that is something that lead artist Scott Kester promises won't happen with Borderlands 2. "We had some digs on the usability on the PC side because it was designed on the console," Kester told me at PAX Prime today. "We're making sure [on Borderlands 2] that it works great for the mouse and keyboard style. "Whatever [platform] you're on, we want the game to be as awesome as it can be." 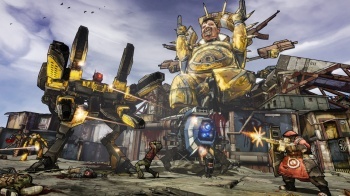 Giving the player the ability to play how he wants is a big push for Borderlands 2. Kester is even making sure that the sequel will let you play coop in split-screen, even when playing online. "Supporting split-screen was a really strong [goal] for us," he said. "We're making sure that the new UI works well in split-screen as well." Kester and the rest of the Gearbox team seem committed to making sure Borderlands 2 pleases as many players as possible. I wonder why? Look for the game in mid to late 2012 on PC and those crazy Xbox 360 and PS3 machines I suppose.